(L) An image of James early in the war indicated by the Royal Australian Engineers collar badges worn by Citizens Militia Forces. (R) James’s fibre identification discs. The fourth son of twelve children, when the First World War was declared James Albert Pasfield was the first in the family to take up the cause enlisting with the First AIF on the 21st August 1914. Joining amongst the recruits of the 1st Field Company Engineers (FCE) at Moore Park, twenty year old James had already served for two years with the 6th Field Company Engineers of the Citizens Militia Forces. This previous experience could well have aided James’ promotion to the rank of lance corporal the following day. James was a plasterer by trade and was living with his parents at their Dulwich Hill home at the time he enlisted. He was allocated regimental number 139 and immediately went into training with the newly forming unit.The 1st FCE were established and fully equipped by early September 1914 and continued training up until the 18th October 1914 when they embarked from Sydney aboard the HMAT ‘Afric’. A postcard of the S.S ‘Afric’ signed by men serving in the 1st FCE. James was promoted twice prior to embarkation and was a corporal when the 1st FCE arrived in Alexandria on the morning of the 5th November 1914. The unit moved out into the desert at Mena Camp where they trained for the next three months.Mena Camp was located near the pyramids and the Sphinx: many of the men would visit the attractions when granted leave. Men of the 1st FCE including the transport section photographed at the Sphinx. On the 3rd March 1915 the 1st FCE left for Lemnos and this is recorded on James service record as ‘proceeded to join MEF’. The 1st FCE spent their time on Lemnos training and preparing themselves for the upcoming Dardanelles operations. Shortly afterwards the unit was chosen to follow and support the 3rd Brigade infantry men on the day of the landing as they were considered “the best equipped and trained”. The unit was spread across several ships on the morning of the landing and there is no indication of when James landed or which infantry battalion he was attached to. Their role on the first day was to follow close behind the infantrymen once landed and assist them in establishing trenches upon reaching their objectives. On the day it didn’t work out like that, many of the sappers joined the fight against the Turks during the afternoon’s confusion and did not return to the beach until the next morning. The 1st FCE based themselves near Anzac Beach and set to work over the early days of the landing building and maintaining the pier so necessary to land further men and equipment. Once the pier was completed the 1st FCE moved forward to the 1st Division sector of the line and assisted the infantrymen in shoring up and securing the trench system, extending saps and communications trenches and constructing wire obstacles. James fell victim to dysentery on the 9th May 1915 and was hospitalised (most likely on Anzac) before re-joining the unit on the 26th May 1915. Even at this early stage the harsh conditions were causing illness. According to McNicoll’s history of the Royal Australian Engineers, at the time “everyone suffered from dysentery”. Early in June 1915 mining operations were begun by the engineer units on Gallipoli. The closeness of the trenches had led to the situation where both sides were attempting to tunnel underneath each other and explode mines to destroy the other’s tunnels. James would have been involved in these operations. On the 29th July 1915 James was collected by the men of the 3rd Field Ambulance suffering from influenza. The following day he was moved to a No.16 Casualty Clearing Station before being transported to hospital at Mudros. His condition must have been quite serious as he was later moved to Malta aboard the hospital ship ‘Devanah’ on the 5th August 1915, finally being admitted to St. Patrick’s Hospital on the island. James was not fit to leave hospital until the 26th September 1915 when he was transported back to Egypt aboard the hospital ship ‘Karoola’. The 1st FCE had begun withdrawing men from Gallipoli around the 13th September 1915 however sections remained. James had also been promoted to the rank of sergeant on the 11th August 1915. Several weeks later James embarked for Gallipoli once more on the 18th October 1915 aboard the transport ‘Borda’. The remainder of the 1st FCE were still involved in maintaining trenches and other mining operations. James landed on the peninsular once more on the 25th October 1915 and did not return to Alexandria until the 27th December 1915 aboard the troopship ‘Caledonia’; I suspect that he had left Gallipoli with the remainder of the unit on the nights of the 12th and 13th December 1915. The 1st FCE returned to Tel El Kebir and shortly afterwards began preparing for the move to the Western Front. On the 1st March 1916 James picked up an unknown fever which led to him being hospitalised at Serapeum. He was moved to the No.1 Australian General Hospital at Ismailia the following day where he was diagnosed as suffering from enteric fever (typhoid). He was struggling with the illness and was transferred to the infectious diseases hospital at Choubra on the 25th March 1916. James recovered slowly and eventually moved to the Convalescent Depot at RasElTin on the 18th April 1916. He did not return to duty until the 10th May 1916. James on the left in Egypt after Gallipoli. Note the warrant officers crown on his right sleeve which could date this photograph to May 1916. It is not known what course James was undertaking. He returned to the Engineers Training Depot on the 2nd August 1916 and remained there well into 1917, missing the battle at Pozieres where his elder brother George was wounded. James did not embark for France until the 16th May 1917, arriving at Etaples on the following day. On the 24th May 1917 James was amongst a group of seventeen reinforcements taken on strength by the 1st FCE whilst they were in billets at Lavieville. He had to revert back to the rank of sergeant upon arrival and there followed a few quiet months before the 1st FCE moved up into Belgium in mid-August 1917. On the 5th September 1917 he was detached to the 1st Australian Infantry Brigade Musketry School. Whilst James was away the 1st FCE moved to the canal area of Ypres in preparation for the Third Ypres offensive. Returning on the 11th September 1917 the unit was involved largely in the construction of heavy artillery positions. Three officers and one hundred and two other ranks were attached to the company from the 1st and 3rd A.I.F infantry battalions on the 16th September 1917 to assist the sappers in the upcoming operations. The level of enemy shelling increased over the following days and at 5.30 am on the morning of 20th September 1917 the Battle of Menin Road kicked off with the 1st FCE soon amongst the thick of it. A report on the 1st FCE’s actions during the battle exists at the rear of the unit’s war diary for that month. James was section sergeant with No.4 Section and an in depth look at the sections involvement during the battle is contained within this book. Suffice to say that James survived the Battle of Menin Road and was involved in a similar battle only weeks later when the section went into action at the Battle of Broodseinde on the 4th October 1917,undertaking operations very similar to those they had carried out at the Battle of Menin Road. The Battle of Poelcappelle followed Broodseinde three days later and it wasn’t until the 10th November 1917 that the village of Passchendaele itself was finally wrested from the Germans bringing the hard slog of the Third Ypres Campaign to an end. James served through the New Year without incident and it wasn’t until mid-April of 1918 that the unit were in the thick of the fighting again containing the German advance on Amiens in the Hazebrouck area during the period of 12th to the 15th April. The failure of the German offensives, particularly at VillersBrettoneux were indicative that the course of the war was on the turn with the allies in the ascendancy. The success of the operations east of Amiens on the 8th August 1918 marked the beginning of the one hundred days until the end of the war on the Western Front. The 1st FCE had established billets in the village of Harbonnieres on the 10th August 1918 and it was here that James suffered the wounds that would lead to him leaving the Western Front the following day. The evidence suggests that James was standing in the doorway of the sergeants’ billet talking to Sergeant George Taylor and others when a shell landed upon them that eventually killed Taylor. James suffered shell wounds to the head, arm and leg and was picked up by men from the 3rd Field Ambulance and admitted to the 53rd Casualty Clearing Station on the 12th August 1918. From the casualty clearing station he was sent to the 47th General hospital at Le Treport on the French coast. The serious nature of his injuries lead to him being sent back to England aboard the hospital ship ‘Aberdonian’ two weeks later. James was hospitalized at the 1st Southern General Hospital in Birmingham from the 26th August 1918 until the 19th October 1918. The war was close to an end at this stage and on the day of the armistice James was serving at the No.1 Command depot at Weymouth. Less than a month later on the 9th December 1918 James embarked aboard the troop ship ‘Leicestershire’ bound for Australia on 1914 leave, his war was over. James arrived back in Sydney towards the end of January 1919 and was discharged on the 24th March 1919. He had spent over four years serving abroad and it is not known how James coped with the return to civilian life. It is known that he married Norah Hodgson shortly after returning home and lived a full life until he passed away in June 1963. Two photographs of James and Norah at the time of the wedding exist. 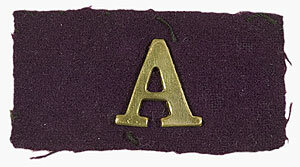 One has James sitting proudly in a chair, a wound stripe on the left forearm of his army tunic and a brass letter ‘A’ mounted upon a purple patch on his shoulder indicating that he was an army engineer who had served at Gallipoli. The other photograph was taken outside the church and behind James and Norah are two ex-servicemen wearing slouch hats whom I suspect were old comrades. James and Norah’s wedding photographs. James Pasfield’s WW1 medals. (1914-15 Star, British War Medal, Victory Medal). The twelve Pasfield children: 1888 William H, 1890 George A, 1892 Harold, 1894 James A, 1896 Thomas H, 1897 Grace, 1899 Ellen, 1901 Hector, 1903 Kathleen, 1905 Walter, 1907 Arthur, 1910 Ada.